They first collect the children and take them to the DSS class. This is often a temporary shed put together by the builder so that the laborers’ children can be looked after while they are at work. It may or may not have basic amenities like drinking water, a bathroom, power connection or windows…but then at least it is a roof over their heads; because sometimes, the class is held in the open under a tree or in a slice of shade of another hutment. No matter what the class is like, it has to be cleaned first by the teacher and the mats spread out. The walls of the class are filled with charts and other displays which vie for any child’s attention. Each class consists of about 30 to 50 children ranging in the age group of a few months to about 12 years. For a class of 30 children, usually there is only one teacher; for larger classes there are two – one for the crèche children and one for the rest. As most of these children are first generation learners and are unaware of rudiments of personal hygiene and neat appearance, the first thing the teachers do is teach them the importance of cleanliness by personally cleaning them and showing them how neat and clean they can be! Children being children are quick learners and take the same message back to their homes, and the teachers’ perseverance pays off. The teacher claps and the children assemble for the DSS prayer - a promise about a child’s determination to attend school no matter what the circumstances – soon fills the air. It is followed by some physical exercises. The importance of exercise is taught through song and dance. The teacher’s skills of multi-tasking are next tested. She has to form their groups according to not only their ages but also competency levels and assign them work which she supervises. A number of educational games are used which have been specially designed and made by the DSS staff. Along with the learning, there are some tears, some whining, and some fights that have to be resolved and put aside. After a while it is ‘tiffin’ time and children are taught to eat without wasting and eat healthy foodstuff. 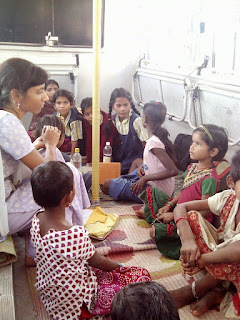 The teacher ensures the children, who have to go to school, leave on time and have completed their home-work. For the rest it is craft and art activities. Another set of children who come after school is welcomed. They are happy to join in the art and craft work. Then a story session, some project work, supervising home-work, gardening, tidying up the class, outdoor play…. the list continues. In the meantime, the teacher also has to interact with parents and answer their queries and put their doubts to rest. Involving parents in their children’s development is a major responsibility. The teachers also interact with the site supervisors etc. as required. Safety of the children is given utmost importance and looking after 30 odd kids is no laughing matter. Record keeping is next. Keeping track of attendance, what each child has learnt in a week, which teaching aids are used often, which ones need to be made, the visitors’ book and so on. But still, the teachers are always smiling and willing to share an anecdote about their young wards. They are proud of ‘their’ children’s achievements in school and display any prizes or medals won by them and share various bits of information like any proud mother would! They are truly our foot soldiers who keep working whether it’s scorching hot or pouring rain. Most of them step out of their homes to work for the first time when they join DSS as teachers. Many are first generation learners (or at least those who have completed high school) in their families. They are proud of their work because they know the importance of having an education and they are determined to give the same opportunity to others. As their confidence increases, they are ready to take on more responsibility and DSS encourages them in every possible way. Some even take up part-time academic courses and continue with their education. If you are wondering what motivates them to work so hard and tirelessly in such a challenging environment, it is definitely not their salary. It is their commitment to themselves and to society. They thrive in the success of their students without even being aware of the life changing influence they have on their students! They are, like all foot soldiers, the true heroes to be lauded. God bless each of them!